Gordon Redd Jr. recently donated $50,000 to the Mississippi State University Foundation on behalf of his company, Redd Pest Solutions. The contribution will help fund the new termite technician training facility on campus. “The Redd family has deep ties with Mississippi State University, and they stepped up in a very timely fashion to partner with us, which we are so grateful for,” says Will Staggers, assistant director of development for MSU Foundation Inc. The new facility is being dedicated in memory of Redd Pest Control’s founders. In 1946, J.C. Redd started the company in Jackson, Miss., and later solicited the help of his two brothers, Gordon Sr. and Elmore. 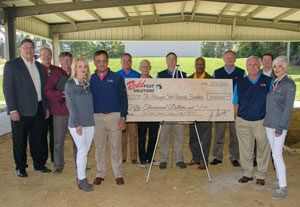 The new termite training facility is scheduled to be open in early spring 2019, and it will be the first hands-on training facility of its kind in Mississippi. Pest management professionals throughout the state and neighboring states can take advantage of the training for their termite technicians. Based in Gulfport, Miss., Redd Pest Solutions is a third-generation, family-owned company, with fourth-generation family members serving active roles today. Since 1952, the Redd Man has been serving customers along the Gulf Coast regions in Mississippi, Louisiana and Alabama.